One day this summer when I was supposed to be writing my dissertation, I decided to make an Indian feast. After pulling the skin and fat from a mountain of chicken thighs for a recipe that called for them to be free of such obvious goodness, I found myself with an unappealing pile of slippery, yellowish chickenness. Not being one to waste anything when it comes to food, I asked myself, “what does one do with an unappealing pile of slippery, yellowish chickenness?” My good friend google was quick with the answer: make schmaltz. And thus began a week of adventures in Jewish cooking. Hanukkah began at sundown last Friday, Dec 11th this year, so I thought this post was appropriate for the season. I’ve had some great Jewish friends over the years and while reading a book on the history of gastronomy in grad school realized that I knew very little about the often complex culinary rituals and traditions associated with the religion. It’s all still very new to me but I definitely related to the dishes I made as having the potential to be the ultimate comfort foods. My foray into Jewish cooking began with making schmaltz with the aforementioned chicken skin and fat. 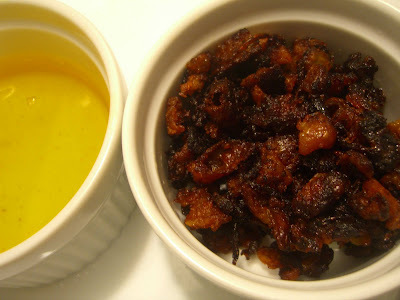 Schmaltz is animal fat rendered over low heat. There’s a comprehensive, illustrated recipe here. Because I also had a pile of chicken skin, gribenes were the tasty byproduct of my rendered chicken fat. 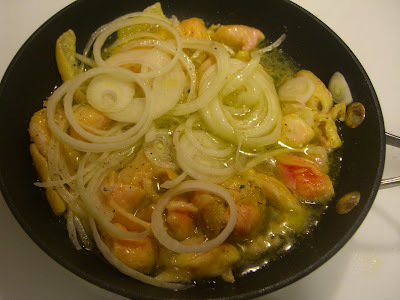 I cut the chicken skin into small pieces and tossed it, along with a sliced onion and some salt and pepper, into the pan with my fat. Turned the fire on low, stirred occasionally, and about twenty minutes later had a pan of crispy chicken cracklings and fried onions. 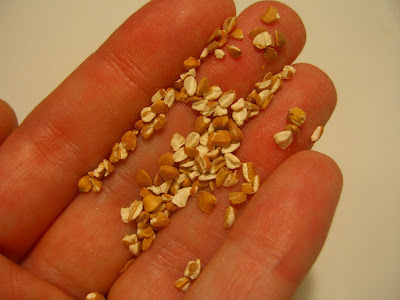 Here’s a recipes for gribenes on Epicurious. The gribenes were good by themselves (who doesn’t like fried chicken skin?!) and I stirred them into a warm German potato salad later in the week. Not something I’m going to make every week, as I’d like to live past the age of 30, but I thoroughly enjoyed the crispy crunchy little cracklins. With the cup of clear yellow schmaltz sitting in my fridge, I elevated one of my favorite recipes to new heights. I have loved Martha Stewart’s mom’s potato latkes (crisp potato pancakes) recipe since I saw her prepare it on her show years ago. There's an excellent illustrated, step-by-step version of Martha’s recipe here. 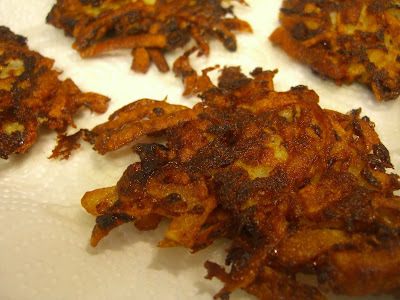 Instead of simply frying the latkes in vegetable oil, I fried mine in half vegetable oil and half schmaltz in a well-seasoned cast iron skillet. They were impossibly crisp and flavorful and best eaten hot, straight out of the fat. Boy I wish these were a tradition in my family so I had an excuse to eat them at least once a year! What to do with the remaining schmaltz? I remembered an article I’d read in Mark Bittman’s New York Times column about a dish he grew up with called kasha varnishkes. I loved the way the dish sounded and repeated the name over and over when I read the article – must be why it stuck in my brain. 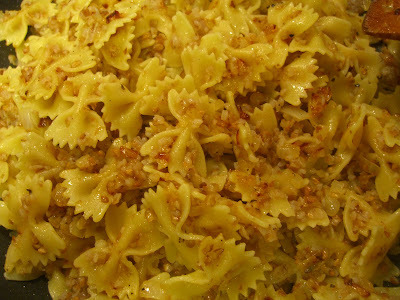 Bittman waxes on about the combination of kasha (toasted hulled buckwheat groats), bow tie noodles, and onions slow-cooked in schmaltz. 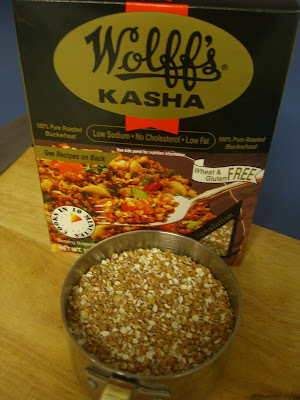 I’d never even heard of buckwheat groats before, but I easily found kasha in my grocery store in the “ethnic” foods section near the matzo. 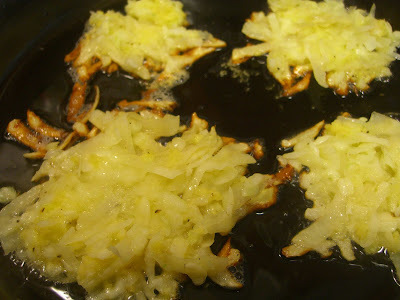 The final dish (following Bittman’s recipe) was subtle, slightly sweet from the caramelized onions, and comforting. yum yum. indeed. that, and also your post from chicago on korean food. mmm. so now you live in riverside? i used to frequent the area every saturday morning while my kids were in korean school over in 5 Points. i loved walking in Metropolitan Park. enjoy!